The days are getting much warmer and the humidity less bearable. The best way to fight the desire to stay indoors and away from the many jobs that needed completion is to raise the level of fitness. Gradually over the last two and a half months we have been increasing the amount of work done in the pool. A few more laps for the lung capacity, a few more repetitions of the various exercises to strengthen the muscles and keep the joints flexible. The hats are on earlier in the day, long sleeves even though they make you perspire more. Sunglasses just to have something fog up. Water bottles strategically placed to ensure a constant intake. The kidneys process on average about 100 ml per hour. The average bladder holds 500 ml. So you should be peeing every 5 hours under normal conditions. When working in hot conditions you don't want to wait 5 hours to find out you have a problem. Moisture loss from perspiration is high and needs compensation. If your urine is a dark yellow you are not taking in enough water. Check this regularly when working hard in hot weather. Be careful of lazy bladder syndrome. This is when you have the desire to urinate very often. This can have been created by urinating so frequently that the bladder trains itself to send the signals more frequently. This can be fixed easily by holding off and retraining the bladder. If this doesn't work then you may have a more serious problem. There is growing satisfaction as your body gains some match fitness and the less than pleasant conditions don't feel all that bad. Don't push too hard. Regular breaks to cool down are critical. Building up stamina in these conditions is no different from athletic training. It takes time and a slow process is a good process. The worst outcome is to be hurt and lose all ground gained. Conversely avoiding the confrontation is the worst thing for your body. It weakens the body and the mind and is unhealthy in the long term. Sometimes there is spare space in the vegetable bed for which we don't have an immediate use. This is a rare occurrence for us as there always seems to be something that could be planted. When this space does arise, it is a good opportunity to perform some lazy gardening. A generous layer of chicken litter is put over whatever are there, weeds and all. This is then covered with thick biscuits of hay or straw and left alone. Within a very short time a miracle occurs. 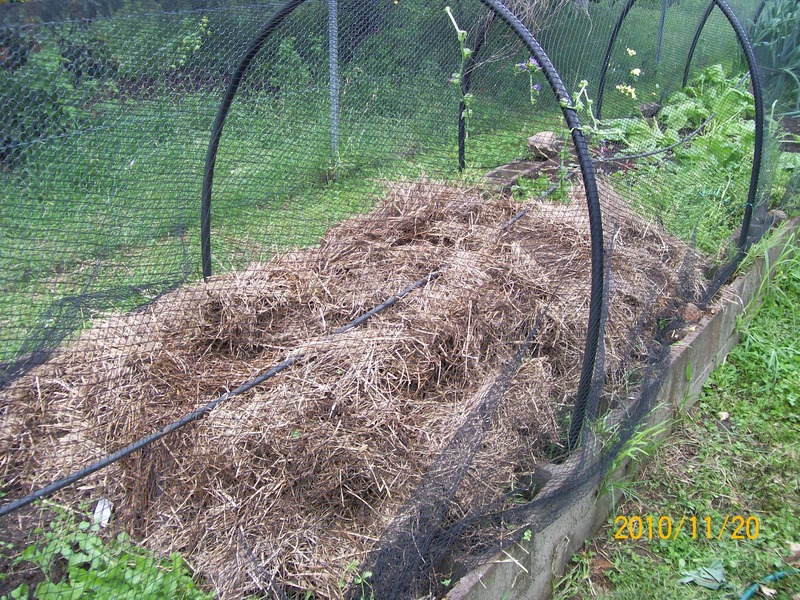 The mulch kills off any green growth and the worms feed off it and the chicken litter. They dredge through the soil making it loose, crumbly and very rich in nutrients. What is left of the mulch can be reused on another spot (with some additions). All this is performed with the minimum of effort. 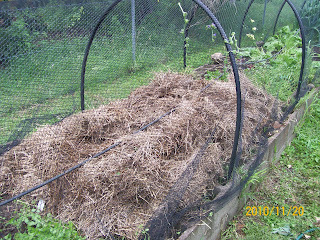 Sometimes if time permits we even bury material due for composting in trenches in that bed. This really gives the worms something to work on. You will find the soil becomes filled with worms as large as miniature snakes. When recently harvesting cabbage ie one every few days, the stump and a number of outer leaves were left in the ground to be attended to at a later time. 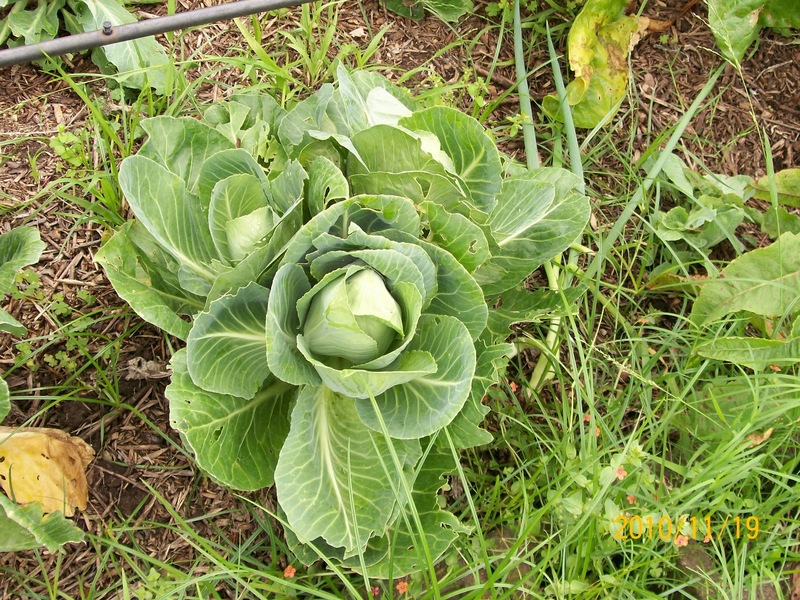 Well the later time was long in coming and the cabbage decided to regrow. It shot out a number of fist sized clumps. When the worst of the outer leaves were removed there was a very nice little edible cabbage. Chopped and lightly fried in Extra Virgin Olive Oil, fish sauce and some chillies, it becomes a delicious treat. Some time ago there was a big effort by us to reduce costs. One of the targets was the telephone account. A number of new practices went into place to trim its size. Eventually, we more than halved the monthly amount and put the savings to better use. Step one was to get rid of unwanted services such as the rental on extra handsets, which were promptly returned to the post office. Rather than pay for an answering service we used our own answering machine. This has the benefit of allowing an opportunity to filter unwanted calls. Step two involved returning calls after peak periods ie 7pm, avoiding initiation of useless calls. A useless call is one which conveys no useful and timely information which can be put off until a face to face meeting. Many return calls were relegated to email so that a lot of people could be contacted through one dial up transmission call (we as yet don't have Broadband). Care was taken with calls to mobile telephones (best avoided) and long distance calls, especially timed local calls. Some years ago what was a local fixed price call changed. Local calls now cover only a very small distance and timed local calls are in force for everything else. Step three was to look at the makeup of our remaining calls. As it turned out, all our calls are of short duration, therefore a plan which gave unlimited time for a fixed price per call would have increased our costs. This is an important step. We simulated our call data through a number of offered plans. All the fancy offers increased our costs. Providers spend a lot of time finding offers which will increase your payments not decrease them. There is always the danger of looking at a new offer by a supplier which offers all the calls you can make for a fixed monthly fee. Closer analysis usually shows the fixed fee is greater than the amount already spent. The mobile telephone is a wonderful invention; it is also a revenue generator for someone else. A business person will find it difficult to operate without a mobile. For the average person who may really need to stay in touch with family or friends for a particular reason a mobile telephone with a prepaid card is more than adequate. Is it really necessary to peer mindlessly at a supermarket shelf and ask your partner who is elsewhere whether they wanted the 375gm or the 750 gm container? A little bit of planning can save time and interruption. Working outdoors alongside others who carry a mobile telephone is an interesting experience. Productivity declines rapidly when one person is answering yet another call. Worse still if the task is a two person effort ,one is left standing uselessly while the other chats away. One important point about mobile phones is their settings with the provider. Unless these settings are carefully made, the provider will chew up the balance of the prepaid card faster than you can refill it. Options such as a message service and automatic notifications are always at the user’s expense. It is important to ensure your level of Omega 3 intake is balanced with Omega 6 intake. Omega 3 is predominately found in fish of the deep sea variety and some seafood. Omega 6 is predominately found in vegetable oils. Catching your own fish can be the cheapest method of keeping a regular supply. The only down side is the limited species available in any one fishing area. Buying frozen fish (whole or fillet) is reasonably cheap and just as nutritionally good. Buying from the local fisherman's co-op is the next cheapest source and the variety of species is greater although a significant jump in cost over fishing and frozen. Sometimes two to three times dearer than buying frozen. The best buying for us has been to purchase frozen caterers packs of 5-10 kg. These are called “shatter packs”: the individual fillets are packed in a layer separated by sheets of plastic which you can later recycle. Individual fish fillets separate easily. The range of these is quite broad and in addition many are packed by fillet size. 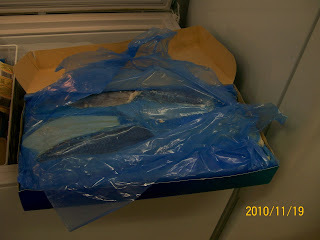 Some varieties such as Sole may need to be scaled and species such as Sardine also gutted before use, but on defrosted fish, this is an easy task. One of the best all round fish we have found is the deep cold water Hoki. It has a delicious white flesh and can be used in a whole host of different meals. Don't forget to buy the skin on fillets; it’s cheaper and better for you. New Zealand Green Lip Mussels are extremely cheap in one kilogram frozen packs minus their shells. They are recognised as an anti inflammatory and without a shell there is no struggling with your meal. They are naturally high in Omega 3 as well as Glucosamine and Chondroitin. The latter two are necessary for growth and maintenance of healthy cartilage. Occasionally you may come across Australian frozen shelled prawns. These can be very well priced when you take into account you are not paying for the shell that will be discarded. We avoid imported prawns because of the poorer controls over them. Although not high in Omega 3 there is little else as pleasurable on a hot day as freshly caught cold prawns and a chilled glass of white wine. There are occasions when we want only a glass of a particular wine. This means the remainder must be kept for another occasion. The problem being that the remainder oxidises and becomes undrinkable. A simple solution is to have a few different sized bottles handy. 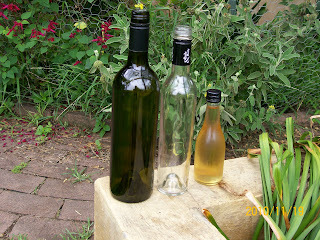 If you only want one glass then decant the contents into a 500 ml or a 375 ml and a 160 ml. A marker pen will enable the appropriate writing to be made if you don't trust your memory. We find screw top bottles the simplest but corks work just as well as long as all components of your chosen solution are sterilised after each use.